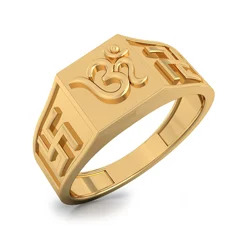 Men who appreciate and wear jewellery are just as much obsessed with Gold as women might be when jewellery shopping for men comes into discussion Gold rings have to be a part of it. Gold Rings for Men at Papilior are available in the most tasteful and delicate men's ring designs that will match up with the masculine personality. Suave and stylish men’s gold rings perfect for engagements and weddings add an ethnic aspect to it too. - Most of the pieces exhibited in our online jewellery store are made in 18 kt gold, of different color. We take a closer look at different types of gold colors and purity is what has made gold the most popular metal for jewelry. - Mixing metals like white gold and yellow gents gold ring is a smart option; Yellow 18kt gold tends to look more formal and dressy, capable of withstanding everyday wear and tear. - Designs of Yellow gold or rose gold rings are amazing choices if can add glamour to your look for any occasion. Rose gold is an easy way to have a special and a very vibrant piece on your hand and ideal for a unique pink gold wedding band Buy gold and see for yourself! 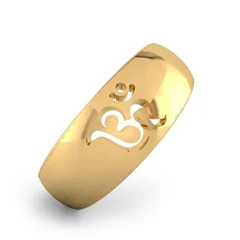 Gold that is considered auspicious is majorly used to gift as signs of blessings, good luck or love, this eternal metal shows commitment and is something that hasn't or ever will go out of fashion. Men have minimal accessories that are sophisticated and that they enjoy to indulge in and gold rings are definitely one of them, experience here designs of men's ring for the workaholic, the life of the party or the eternal soulmate; something for everyone.